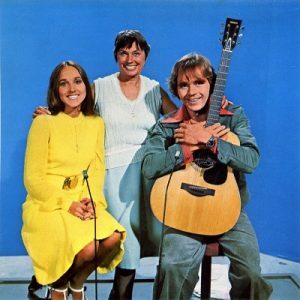 Maria Morgan and Keith Field were the presenters of the 1970s childrens TV show ‘A Handful of Songs’. Made by Granada studios in the late 1970s – early 1980s, this preschool lunchtime program was shown on ITV around midday. Each episode lasted approximately ten minutes and was hosted by two presenters (one male and one female). Kathy Jones was the first presenter on the show partnered with Alistair Johns. Kathy then partnered Keith Field for a while until Maria Morgan replaced Kathy. Maria partnered Keith right up until the last episode (379th) was recorded. Muriel Young, then Senior Producer of Children’s Programmes, had the idea for “A Handful of Songs” after working with Wally Wyton who had released an album of nursery rhymes but was busy with Folk Club on Radio 2. Hence Muriel Young chose new presenters. At the start of each programme, the duo would be perched on their seats, microphones at the ready, Keith with his guitar, to sing a variety of songs each week. Such was the popularity of the duos, several LPs were released. The first LP title was “A Handful of Songs from Kathy Jones” in 1972. Keith and Maria released the next “A Handful of Songs” in 1976, which had classic songs such as: A Handful of Songs, Yellow Submarine, Rupert the Bear, The Owl and the Pussycat, Puff the Magic Dragon and A Windmill in Old Amsterdam. To be followed in 1981 by “Another Handful of Songs”. Both LPs produced by Keith Field and David Kassner. Muriel Young was promoted to Director of Children’s television, and when she subsequently decided to retire the new Director cancelled “A Handful of Songs” (as well as other classics like “Clapperboard” nostalgia fans). Maria joined the production of Evita in the West End and released a few singles (see separate Artist entry). Keith Field grew a family business building exhibition stands around the world.